A striking example is Lynne Bright, a 39-year-old secretary at a clinical laboratory in Indiana, who came to Johns Hopkins in February 2000. Two years earlier she had learned that she had kidney failure, when a routine exam revealed an elevated serum creatinine. At that time she had already had high blood pressure for about a year. Urine protein was also abnormal (3 g per day) but serum albumin concentration was normal. She had felt tired for about seven months, but denied loss of appetite, nausea, vomiting, muscle cramps, or itching. By April 2000 serum creatinine level was 8.6 mg per dl. She had been advised to start dialysis but wanted to defer it because she "didn't feel that badly." Current medications included Cardizem, Lasix, Zestril, clonidine, and Claritin. Physical exam was normal (blood pressure was 124/76, reflecting her antihypertensive drug regimen). Laboratory data showed severe kidney failure: serum creatinine 8.9 mg per dl, serum urea nitrogen 92 mg per dl, hematocrit 31 percent, serum potassium 5.6 mEq per liter, serum CO2 19 mM. Creatinine clearance after cimetidine was 6.9, 5.7, and 5.6 ml per minute (average is 6.1 ml per minute; normal is 120 ml per minute). She was instructed on a very-low-protein diet, told where to get essential amino acids, given a prescription for a multivitamin preparation, told to take 30 grains of sodium bicarbonate daily, and sent home. Because of her employment in a clinical laboratory, she is able to conduct her own creatinine clearances after cimetidine and send me the results. She has not returned to Johns Hopkins, but we converse every two months or so and discuss her latest results. 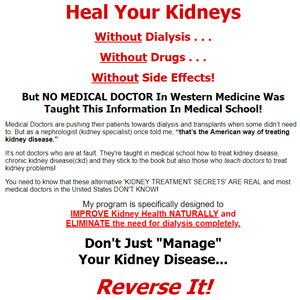 Kidney function has improved (GFR now 14 ml per minute), serum creatinine 6 mg per dl, serum urea nitrogen 68 mg per dl. Her serum CO2 came up to normal (now 22 mM) on continued sodium bicarbonate, and her serum potassium fell to normal (now 4.9 mEq per liter) after the addition of one tablespoon per day of sodium polystyrene sulfonate. (Two tablespoonfuls a day were too much; serum potassium fell to the lower limit of normal.) Blood pressure is well regulated. Her hematocrit is 30 percent. She continues to work full time and has no symptoms. Her mild fatigue was probably attributable to her mild anemia; her health insurance has finally agreed to pay for erythropoietin treatment. She has not progressed in two and a half years. She may continue this way for years to come.